Jay Bird Manufacturing Co., Inc. offers PINE as well as Engineered wood (plywood) pallets both as standard as well as customized pallet sizes. Pallet sizes ranging from 53 ft. length x 10 ft. width to normal GMA style pallets used in industries from defense, technology, medical, electric, aerospace, industrial manufacturing, transportation, food and many other industries. We have the capability to supply your requirements. For International Shipping we offer a couple of choices: a ISPM-15 certified lumber PINE pallet and a Engineered Plywood Pallet. Both are fabricated from premium materials and the plywood pallet does not require ISPM-15 Specifications. Custom pallets can vary depending on the product(s) being shipped, but common variations include the below Please Select product below for further information. We are the source for pine pallets in Arkansas. New to Pallets-Let us Help you determine what you might Require! Two way or four way entry? Your first consideration is to decide the basic type of pallet you need, and whether it is necessary for you or your customer to be able to enter the pallet from all four directions, or from two directions only. A four way entry is more versatile, especially when required to be used in warehouses where space is limited. Also in many instances a four way pallet is useful when loading and unloading vehicles, and when it is important to fully utilize box-vans,freight liners or sea containers. 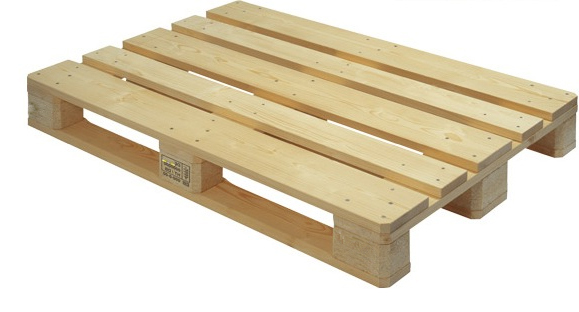 A two way entry pallet however, generally forms a stronger construction and can be purchased at a somewhat lower price. 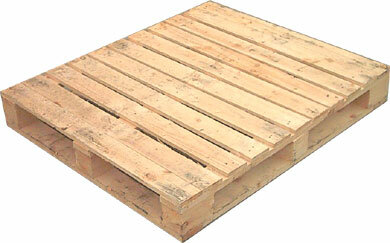 In addition to these standard pallet designs there are a number of other pallet types which may be considered. What will you wish to palletize? Consider the product(s) you intend to palletize. If the pallet is to be used for a general range of products it is often consider the best optimized fit on a standard pallet. Reducing cost and creating a standard within your logistical chain. It may be necessary for you to think whether your general package sizes need review so that one particular size of pallet can best or in some instances we can provide custom made to order pallets to accommodate those specials products that require special optimization of your products to be transported. Dependent on the product and stacking pattern you should then have a good idea of the pallet size you require, and also the top deck coverage you need. Standard pallets are usually constructed with an approximate 60mm gap between boards, but this can be adjusted to suit your requirements, You may of course have the top deck close board, we can provide this top deck in a variety of materials, OSB, MDF, Melamine, Particle Board etc. The larger the gap on the top deck the less timber will be needed to construct the pallet, resulting in a lower priced pallet. Jay Bird Manufacturing Co., Inc. is a licensed export pallet manufacturer. We ship products throughout the world. We design and manufacture a pallet that will get your product overseas safely. When shipping internationally, it is important to consider all angles to make sure your product gets to its final destination without any damage. We will make sure the best materials are used for the job, whether your product or materials are transported by air, rail, sea or road. We have the packaging solution for you. Our staff stays current on all export regulations for hardwood and softwood packaging. Need pallets for exporting? We can provide you with Heat Treated, IPPC Stamped pallets certified for shipping overseas. We custom design & build pallets for a wide variety of industries including aerospace, telecommunications, electronics, computers, machinery, automotive and more. We provide complete assistance for all your palleting needs, and our customers trust us for on-time delivery. We also offer a plywood pallet that does not require the ISPM-15 certification.